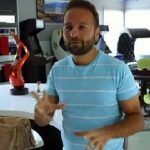 Poker is such a popular game, and has been for so long, that it is a part of our shared culture. Expressions and experiences from the game are common place, but you might wonder what some of them mean or where they come from. If you’ve ever asked yourself: “What is the Dead Man’s Hand?” then this blog post is for you. 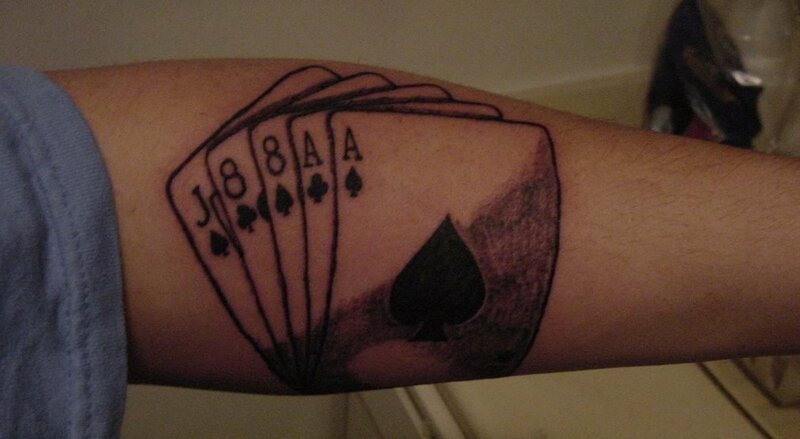 At the moment, the Dead Man’s Hand in poker refers to pairs of black aces and black eights. Dead Man’s Hand definitions have actually changed over the years, though. The earliest reference is thought to be in 1886, where it was described as a full house of three jacks and a pair of tens. Then in 1903, the Encyclopedia of Superstitions, Folklore, and the Occult Sciences of the World referred to it as a very unlucky hand of jacks and sevens. A little later in 1907, 17th century British author Edmond Hoyle, who wrote rule books for games to settle disputes, referenced it as jacks and eights. The black aces and black eights definition we know today only came around in the 1920s. That’s when it was solidified in poker vernacular, in large part because of a biography titled Wild Bill Hickok: The Prince of Pistoleers. Where does the Dead Man’s Hand come from? 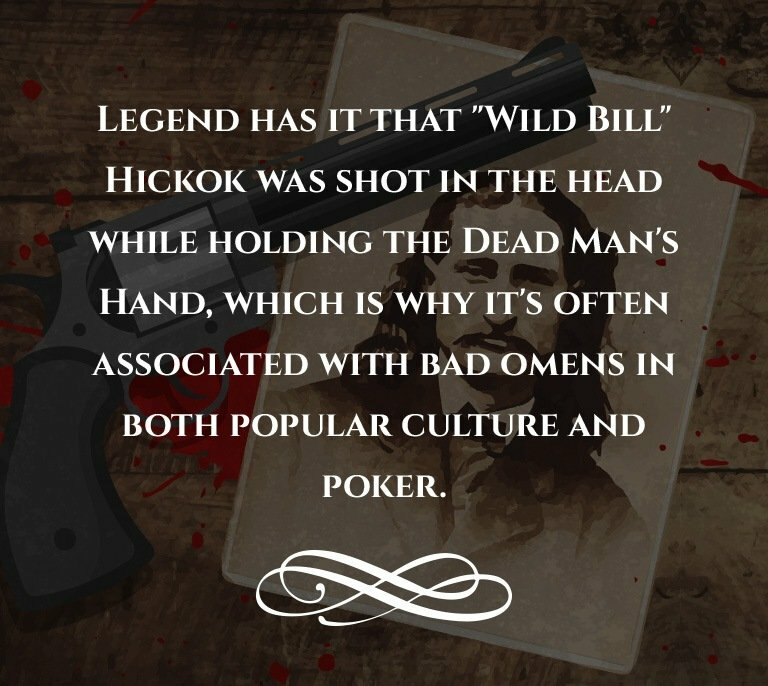 The story goes that this hand actually comes from the death of lawman and gambler James Butler “Wild Bill” Hickok in 1876. He was killed by local drunkard, Jack “Crooked Nose” McCall, in Deadwood, South Dakota. Apparently, after joining a poker table with Hickok, he ended up losing every single dime. Hickock gave him some money to get some food and advised him not to play again until he could afford to cover his losses. McCall was insulted. The next day, McCall entered the saloon to see Hickok playing poker again and was furious. 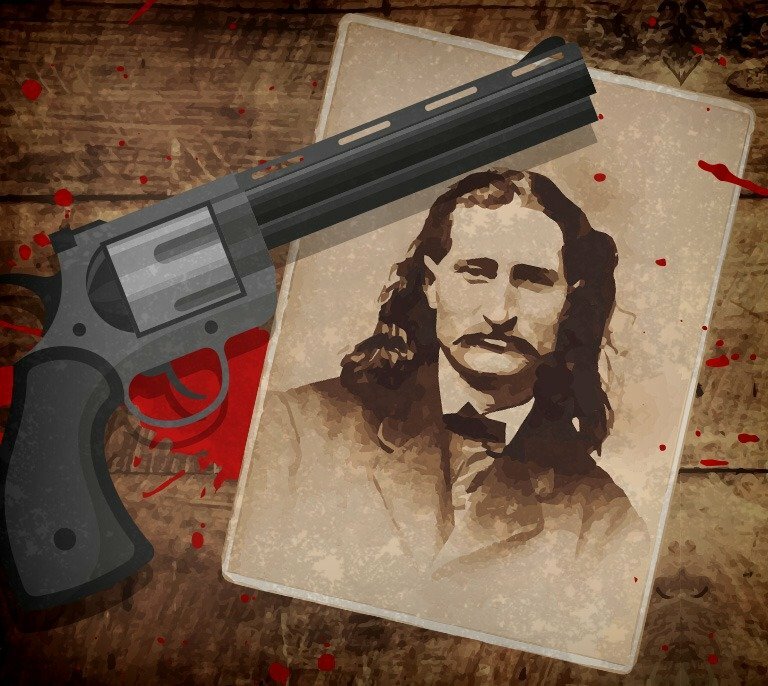 Hickok usually always sat with his back to a wall because he was paranoid about being killed, but on this fateful day he didn’t because another player wouldn’t change seats with him. McCall came up behind Hickok and allegedly shouted: “Damn you! Take that!” and shot him in the back of the head with his Colt .45 revolver. He claimed he was avenging his brother’s death. Hickok died instantly, and McCall was executed by the state seven months later. 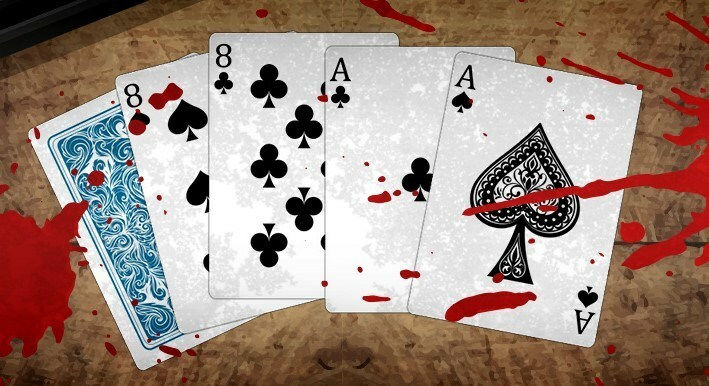 Most accounts say that Hickok’s hand at the time was comprised of black aces and eights, although the Dead Man’s Hand 5th card isn’t specified. 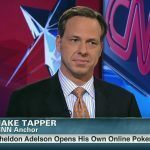 How worthwhile is a Dead Man’s Hand in poker? While the Dead Man’s Hand might have a lot of psychological and historical value, it isn’t actually a very high valued hand. The two-pair, while not a terrible hand in poker, certainly isn’t as worthwhile as a royal flush, straight or full house. While it’s always intriguing to be dealt a Dead Man’s Hand, it doesn’t change your chances of winning or losing. Of course, its real value comes from the perception of this hand. In fact, it’s used as the insignia for the Las Vegas Metro Police Department’s Homicide Division, the LA Police Department CRASH squad and the Armed Forces Medical Examiner System. Tons of artists have drawn inspiration from the Dead Man’s Hand, particularly as an ominous sign of impending doom. What could be better as a sign of foreboding or foreshadowing than to have a character dealt the Dead Man’s Hand? 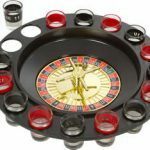 Poker fans often get the reference, presuming an imminent death or at least an unwanted surprise in the future. 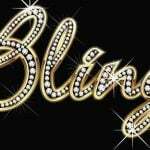 In written fiction, it’s used in a variety of novels. For example, James Patterson references it in Along Came a Spider, with a character telling the story of how her father won his gun with a hand of aces and eights, and even uses the Dead Man’s Hand as her computer password. In One Flew Over the Cuckoo’s Nest, Ken Kesey describes McMurphy as having a Dead Man’s Hand tattooed on his shoulder, which has had various interpretations. Many fans of the book and film have taken inspiration for their tattoos from this. John Ford used to use it as a foreshadowing of death in his films. In Stagecoach, the hand is held by Luke Plummer before he is shot by the Ringo Kid, played by John Wayne. Then in The Man Who Shot Liberty Valance, the titular character draws the Dead Man’s Hand just before his death. TV show episodes have used it too, either as titles of episodes with imminent death or to show opportunities for characters to cheat death in some way. For example, in Criminal Minds, Hotch plays cards with a death row inmate in the hopes of getting the location of another victim. Hotch claims to have a Dead Man’s Hand, which is what the inmate believes he should have. Hotch then reveals another ace, turning his Dead Man’s Hand into a full house and beating his opponent. Even video games make use of this legendary hand. There’s an expansion for Fallout: New Vegas where players can collect cards making up the Dead Man’s Hand to get an achievement. In the card game Doomtown, the Dead Man’s Hand is the highest possible hand, using a jack of diamonds as the kicker. It features in Hearthstone, Werewolf: The Apocalypse, Wing Commander IV and Need for Speed: Carbon as well. Dead Man’s Hand – Ha Ha Tonka. Ace Of Spades – Motörhead. Rambling, Gambling Willie – Bob Dylan. Aces & Eights – Uncle Kracker. Alligator Blood – Bring Me the Horizon. I Am The Storm – Blue Oyster Cult. Aces & Eights – Michael McDermott. Dead Man’s Hand – Moonshine Bandits. With new series being released focusing on the Wild West and even more references to the Dead Man’s Hand, it’s clear that the legend will live on for years to come. Now you’re clued up on the Dead Man’s Hand, you need to make sure you’re au fait with all the other poker hands slang.